Running Doc’s Guide to Healthy Running is the first comprehensive guide to avoiding and overcoming running injuries. The American Medical Athletic Association has estimated that every year 37-50% of America’s 44 million runners suffer a running-related injury severe enough to bring them to a halt. For these runners, injury is a frustrating fate that delays their fitness, performance, and weight-loss goals. With Running Doc’s Guide to Healthy Running, runners can beat injuries and enjoy running pain-free. The book is now available in bookstores, running shops, and online. Click below to order online now. Click here for a free preview of Running Doc’s Guide to Healthy Running, including a table of contents and some of the injuries and conditions covered in the book. 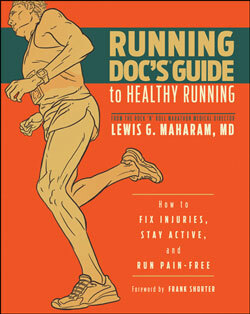 Lewis G. Maharam, MD, better known as Running Doc™, is the most trusted doctor in running. From head to toenails, his book explains healthy running practices and guides runners to the right diagnosis and treatment for over 100 running injuries and related health problems. The book begins with healthy training and gear practices that will help runners avoid injury. Maharam covers non-injury health issues like colds and flu, aches and pains, and healthy running for women. The book’s illustrated Injury Manual includes diagnosis and treatment information for injuries to the feet and ankles, legs and knees, groin and hip, back, neck, and head. Maharam offers simple, effective treatments for every common running injury. Using clear illustrations of injured areas and therapeutic strength and mobility exercises, he describes medically proven ways to fix injuries like runner’s knee, shin splints, Achilles’ tendinitis, IT Band Syndrome, plantar fasciitis, and dozens of other maladies. For more difficult injuries, Maharam explains when runners should seek professional medical care. Runners should enjoy their sport free of pain, yet more than 1 in 3 runners will get hurt this year. With Running Doc’s Guide to Healthy Running, runners can fix injuries, stay healthy, and run pain-free.